The existing architectural footprint inspired the urban maze design concept that aptly mirrored the notorious planning of Kuala Lumpur city. The Wilson Associates design team carved a series of raised platforms that gradually open into different social zones. This typology is similar to the city’s urban complexity, where different cultural enclaves segue into another, creating a dynamic social flow. The lobby is the main social hub—designed as sculptural elements anchored by cascading light sculptures, an abstract expression of the constant rain in Kuala Lumpur with the legends of local folklore inscribed into the transparent pieces. The warm timber skin of the 360-degree Le Bar reflects a warm undertone that is welcoming and yet creates a canvass for the carefully selected furniture pieces for the space. The design centralizes on the 360-degree artisan coffee/pastry bar as the main focal gesture, and towering metal screens inspired by the Wau Bulan Malaysian kites create a visual framework to delineate the space with Sofi's Deli. The unique Chinese restaurant's circular form mimics the Tulou architectural form, creating a focal communal dining theater, with private dining rooms and other functions radiating from this central circular form. 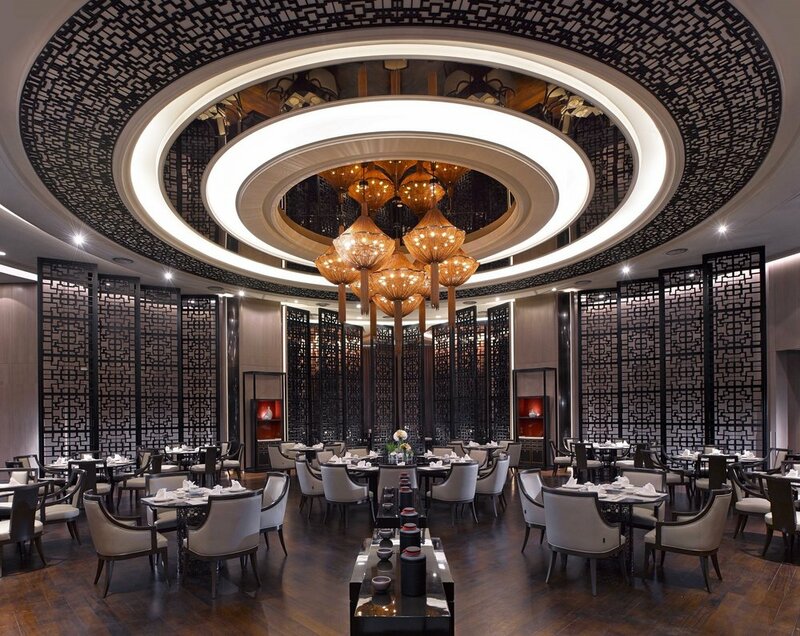 The design of the ballroom is distinct from any typical hotel ballroom with its fan shaped architectural volume. Inspired by the Malaysian Wau Bulan traditional fan structure, the design team crafted a unique ceiling form with a distinctive prism geometry, resulting in a stunning sculptural volume and acoustic architectural feature. The carpet and ceiling seemingly merge with the pre-function area, creating a visual and architectural connection between the two spaces. Designed as an exclusive multi-functional space, the concept of the Executive Lounge is a place where stature does matter. The integration of various communal setups between the bar and the dining area creates a more vibrant space than a typical club lounge. The design of the bar is a custom-designed blend between a French hand-carved 18th-century table and a modern western Brutalist structure, creating a contrasting yet abstract sculptural form. The guestrooms include a walk-in closet and are contemporary in design, with a with a twist of French-inspired spirit which can be seen through the burgundy accents, velvet, and bespoke details within the room. The design elements in the room are clean, and details and artwork are subtly integrated, creating a quiet luxury with unique twists in the detailing—such as whimsical, bespoke throw pillows on the beds. Furniture with burgundy toned leather creates a soft balance to the architectural language in the room. The key is the quiet integration of both function and aesthetics, creating a holistic balance of the overall guest experience. The bathroom is modern, impactful and is accentuated by an iconic free-standing bathtub with a rich bookmatched Italian marble wall.